This is the second in a series of blogs that will provide worksheets or forms for you to fill out with your pertinent information relative to planning your Workamper jobs, documenting information for your RV and vehicles, documenting your healthcare info, etc. 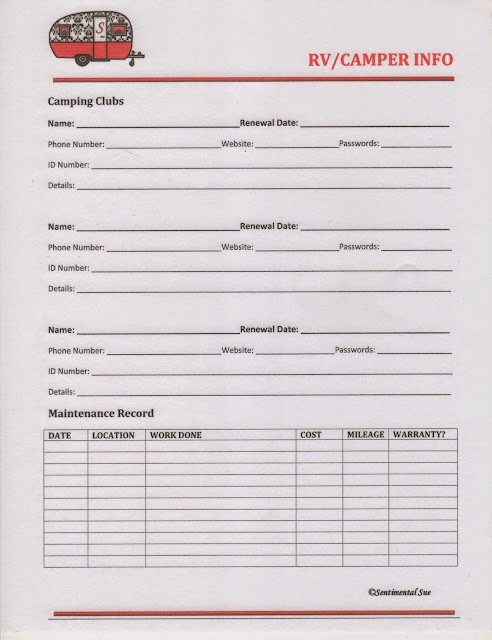 This post is looking at worksheets for your RV/Camper and your vehicle. If you missed the previous post to receive the Worksheet for Workamper Interview Questions, please find the link here! When you are traveling in your RV, or at any time, things can change in an instant. It is important to have pertinent information at your fingertips. It could be as simple as having your Passport America number handy to make a campground reservation or as complicated as being in an accident and needing to find your car or health insurance info. When you need this information quickly, how great would it be to have it all in one location! In an emergency, it may be difficult to stop and think where to find all the pieces of information you need. Or someone may ask a question you don’t have an answer for - like is pre-authorization required to have warranty work done? With these forms, there will be no question about where you should look when time is a factor. My hope is to help you gather this necessary information now, so that it is handy when you really need it. First we will document specific information about your RV such as Make and Model, Year, Length, Weight, and Height. If you do not have this information yet, it is a good time to go ahead and get this. I must confess that we have not gotten a weight on our RV yet – put that on the to do list! Another good thing to have on hand is the VIN number. You will find this on the title or right on your RV. Then you can add a brief description of your camper along with the license number, and any upgrades you have made. For your upgrades you may want to include more detailed info such as cost and date completed. The next section is Insurance information such as the name of the company, phone number, renewal date, website and maybe even passwords needed to sign on the web. 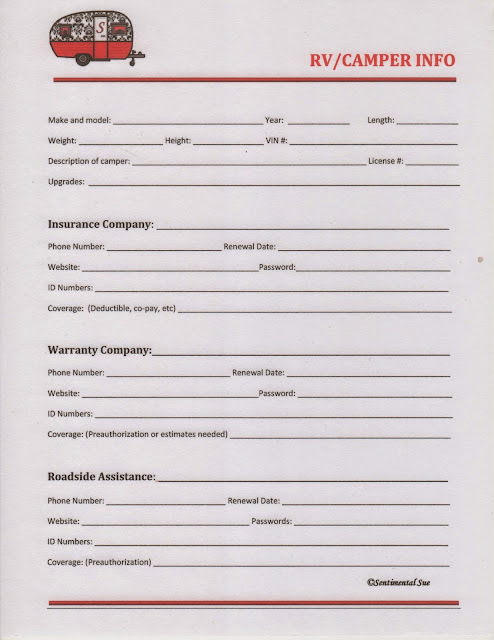 Also include ID numbers, and a brief description of your coverage such as deductible, co-pay, etc. Do you have a warranty on your RV? The next section is for similar information but for your warranty company. You will also fill out name of the company, phone number, renewal date, website, passwords, ID numbers, and coverage including noting if pre-authorization or an estimate is needed prior to the work being done. Roadside Assistance information should also be documented to have when you need it. I realize you probably have a card that you carry with you but the last time I needed it, it took me way too long to locate the exact card and phone number I needed. This also includes name of the company, phone number, renewal date, website, passwords, ID numbers, and coverage. Camping Clubs such as Passport America, Good Sam, Escapees, etc. should also be documented so you have the information at your fingertips when you are making reservations. If you belong to several clubs it is good to have all the info in one place in case you are making a reservation and are unsure which card they may honor. 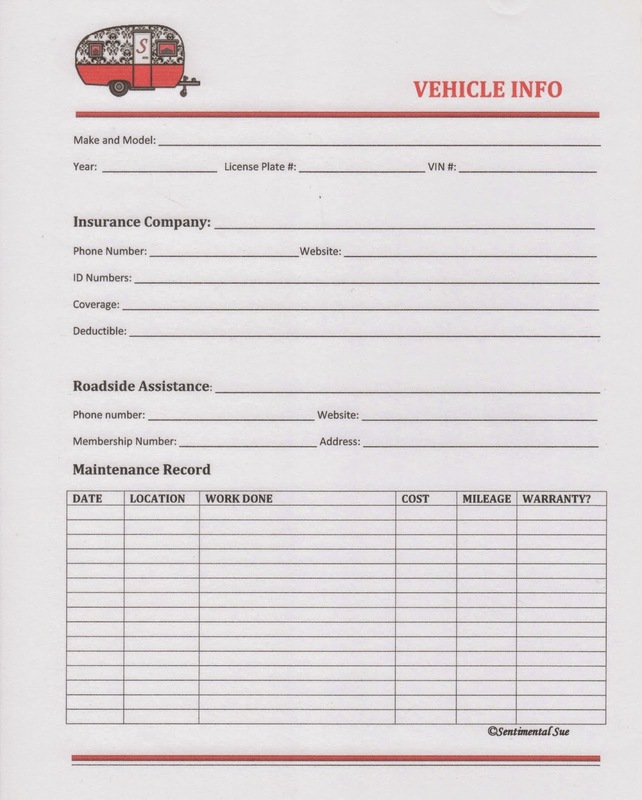 The Maintenance Record will help you keep track of oil changes, new tires, new battery, etc. Keep track of the date, location the work was done, details of the work being done, cost, mileage, and if your warranty helped pay for it. Sometimes you can remember these details fairly easily but usually time goes by quicker than we think. If you had to guess was it 6 or maybe actually 9 months ago since we replaced the tires? And there are actually 8,000 miles on the new tires not 5,000. I only know this because that is usually how our discussions go! This information will also be helpful if or when you decide to sell your RV so that you have exact documentation of the maintenance performed. This is very similar to the RV worksheet except you probably don’t need to know the length, weight, and height! Whether you have a pick-up to pull the travel trailer or fifth wheel, or a car towed behind your RV, we still need to keep track of this info also. It provides documentation for the make and model, year, License Plate number and VIN number. For some reason, I seem to need the license plate number more and more and I cannot remember it! The next section is Insurance information such as the name of the company, phone number, renewal date, website and maybe even passwords needed to sign on the web. Also include ID numbers and a brief description of your coverage such as deductible, co-pay, etc. 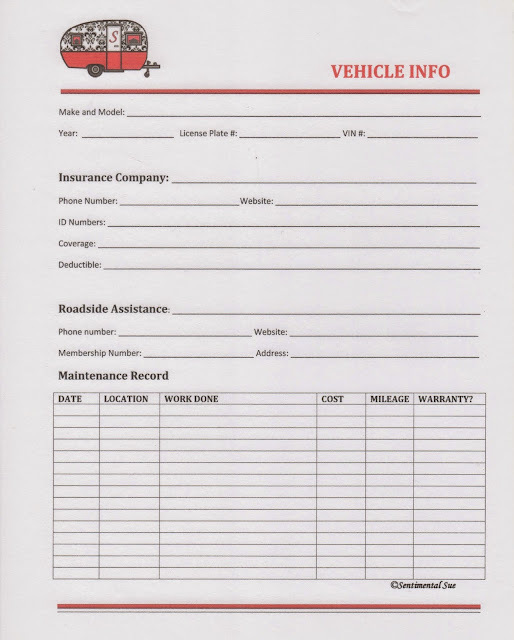 Then lastly we will include a Maintenance Record on this vehicle also. This information will also be helpful if or when you decide to sell your vehicle. You will have exact documentation of the maintenance performed. All of these worksheets can be printed to fit your size of notebook, journal or file. Some people may even keep them on their phone or computer to have a digital file when needed. The RV worksheet could be printed 2-sided. I hope this information and worksheets are helpful to you. Please let me know if you have any suggestions for improvement. These worksheets are always a work in progress as we encounter new situations. They are made from our experiences and needs, yours may be different. Happy Trails! New Workamping Job and New Logo!